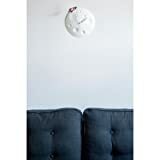 You'll literally be watching time fly by when you stare at this cool new Rocket Moon Clock. 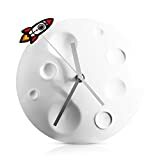 This space age wall clock depicts a metal moon shaped body with normal hour and minute hands and an orbiting rocket ship seconds hand that competes a full orbit every 60 seconds. A fun clock for kids who dream of going into space one day or those just lazily watching the clock and daydreaming about it. Size: 7.9" x 7.9" x 1.6"